Another way to make the homepage attractive, though, is to show the best products on the homepage of your store. It is the best way to get the attention of the users towards your products which increase the chances of more sales. Products from Specific Category Go to the Admin panel of your store and navigate to CONTENT → Pages. Now click on Edit from the Select dropdown of homepage. 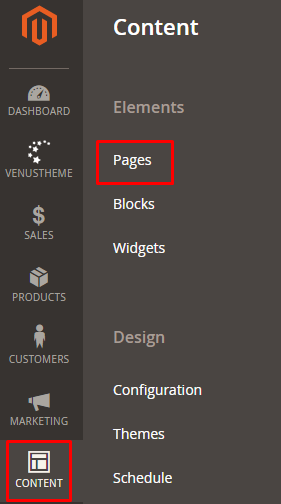 Unfold the Content section and then click on Insert Widget from the homepage editor. Now select Catalog Products List from Widget Type dropdown and fill all the details according to your requirements. After providing all the details, go to Conditions attribute, select Category option and just select the category of your choice that you want to show. At last, click on Insert Widget. Now just click on Save Page. Now go to the homepage of your store, and you will see the products from specific category on the homepage of your Magento 2. New Added Products Click on insert widget from the Content editor of your homepage. Select Catalog New Products List from Widget Type Dropdown and fill the details according to your requirements. After providing all the details, click on Insert Widget. Now click on Save Page. Go to the homepage of your store, and you will see the recently added products on the homepage of your Magento 2. Showing products on the homepage of a store is one of the best approaches to boost the sales and now you should be able to show products on the homepage of Magento 2. In this Magento 2 homepage customization series, you learned how to add image slider in Magento 2 and how to display products on the homepage of Magento 2. Not the answer you're looking for? Browse other questions tagged magento2 product php-7 home-page slider or ask your own question. Magento 2 : how to show custom product slider on home page? how to add home page banner slider programmatically using js code not extension magento 2?